Figure 1 | Ice road construction. Figure 2 | Approximate drilling schedule. Figure 3 | Panoramic view of the Winx-1 drill pad. 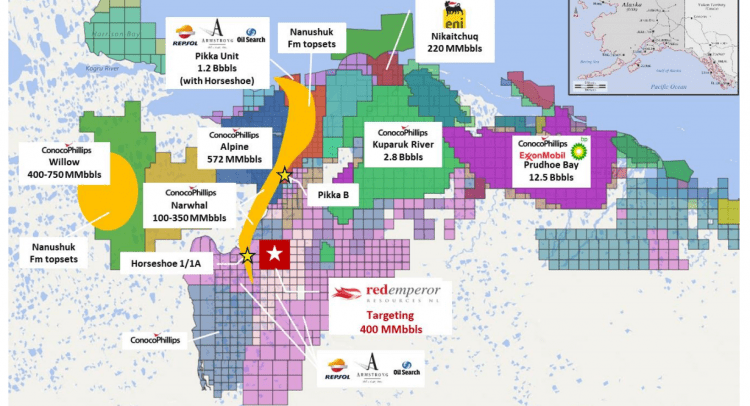 The Winx prospect is a 3D seismic defined conventional oil prospect in the successful Nanushuk play fairway with a gross mean unrisked prospective resource of 400 million barrels (“MMbbls”) (126MMbbls net to Red Emperor) and is adjacent to the Horseshoe 1/1A discovery well drilled by the Armstrong/Repsol JV in 2017. Refer to the Company’s announcement of 25 June 2018 for further details. The primary objective of Winx-1 is the Nanushuk Topset play, targeting the Nanushuk 4 and 5 sands. As can be seen in Figure 5, the Winx prospect has been identified using the Nanuq South 3D which covers the third-party 2017 Horseshoe discovery, plus a large swathe of the “Western Blocks”. Similar amplitude response is observed at the Winx prospect to that seen at the successful Horseshoe well location, which is situated approximately 4 miles (6 kilometres) to the west.